Every business takes on critical questions to achieve their strategic, financial, and operational objectives. Sound business decision-making processes built on risk management principles can help optimize these enterprise decisions, but many organizational, economic, technological, process, and resource challenges can present roadblocks to implementing efficient decision systems. What standards and best practices offer guidance? What enterprise resources can be acquired, expanded, or enhanced to build more effective decision-making processes? What service, software, and information resources do vendors offer? What are each vendor's capabilities, strengths, and weaknesses? How much should be spent on risk management and decision support systems? How can I gain management support? How can return on investments be proven? These questions may require business research and analysis specifically designed to address your unique organizational challenges. IMT's custom research services help answer questions for enterprises, vendors, and others seeking to advance the use of the latest technology, services, and information resources to improve risk-informed decision making in dynamic business environments. An efficient marketplace needs clear communication with well-defined enterprise needs, vendor offerings, and objective facts about resource capabilities and value. 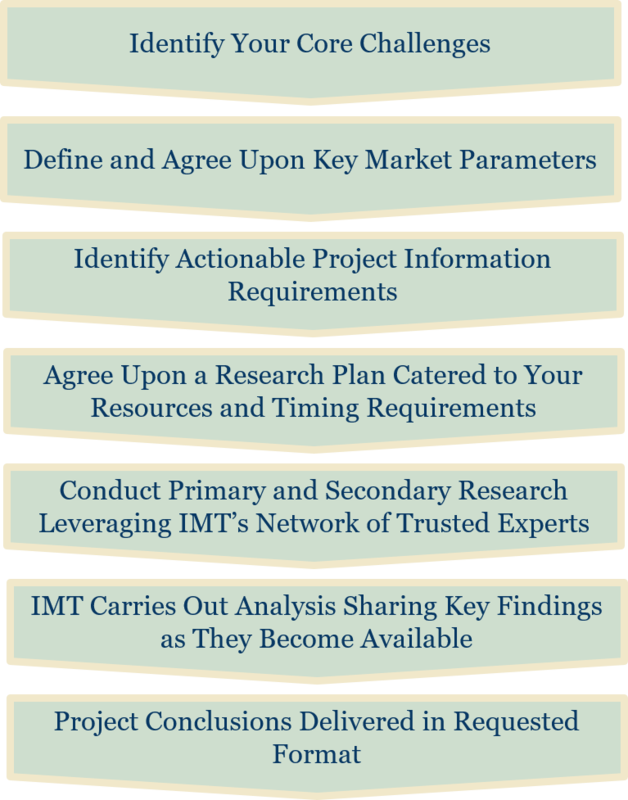 IMT offers custom research consulting and analysis projects for enterprises, vendors, and others who seek an objective third-party, fact-based perspective on demand-side market needs and supply-side resources available to build and support risk-aware business decision making processes. How do you liven up a research methodology description? By using a term like sextangulate. Every research method has strengths and weaknesses with variable costs and value. Achieving high scientific certainty using one research method typically requires large-volume, and usually costly, primary market research data collection. Even the most rigorous approaches to a single research method are susceptible to pitfalls. The best way to address the holes left by one research approach is to supplement analytical fodder by adding another data collection method. In geometry, it is possible to triangulate using two observed points and angles to accurately identify an unknown point. IMT's market research services uses six data collection approach points (a mixture of sources and methods) to sextangulate answers to our client's key questions. 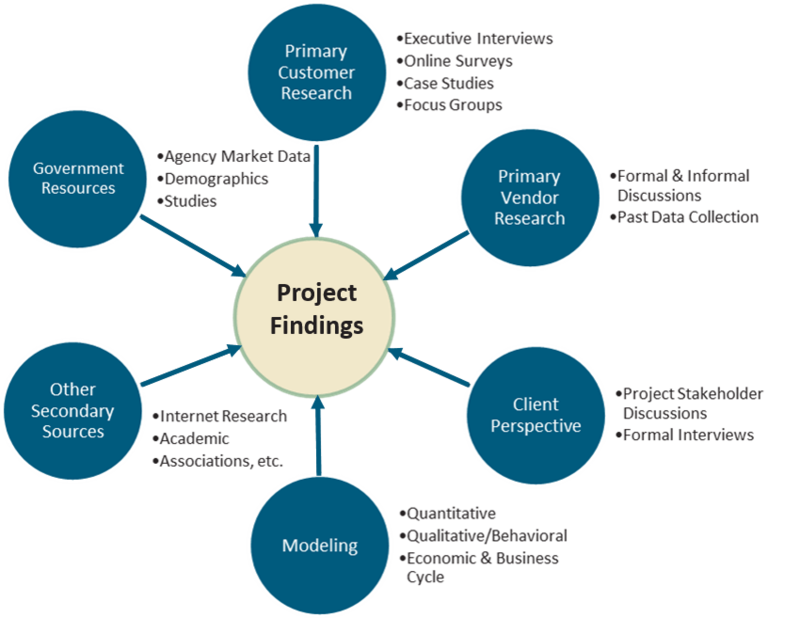 We consider each of the six research approaches in the following diagram and determine the best mix of primary research, secondary research, quantitative research, and qualitative research for every client project. While most projects focus on two or three core data collection methods, IMT will use some degree of information from all six categories to address any possible gaps or weaknesses in the core methods to improve the precision of answers to your questions. Budget and timing restrictions are driving factors for every research design. IMT can consider these constraints and offer tradeoffs in methodology strengths without compromising the integrity of research results. Our extensive business research experience allows us to combine new data collection with our market content knowledge and analytical expertise to offer the most efficient research solution to address your specific challenges. Every IMT custom research services proposal provides a detailed research plan to address your U.S. or global market research requirements. IMT emphasizes essential communication checkpoints in our project engagement process to ensure our research, analysis, and project deliverables stay on course to address your needs with actionable information and guidance. Project deliverables are provided in a format that offers the best communication vehicle to reach your key stakeholders and decision makers. This can include a variety of report documents, PowerPoint presentations, white papers, infographics, media kits, and databases, as well as interactive online or onsite presentations. Our goal is to get actionable information in the minds of those who count most for you. To learn more about our custom business research services and project types that will address your specific information needs, follow the link in the sidebar on this page that best describes your organization or contact IMT directly for a free consultation.